The illustrator Shaun Tan, he paints alternative children stories and strange creatures. I like the stories hidden inside the paintings. In my own art I always have a back story – before and after. I especially love his book ‘The Red Tree‘. Which is your most popular artwork? 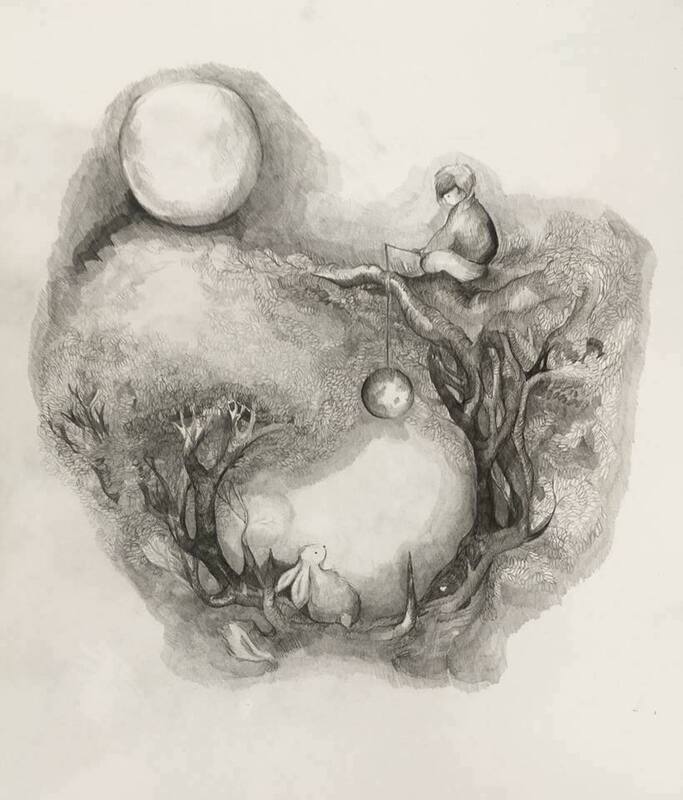 A series I’ve drawn related to the idea of the reality and the surreal: ‘A bear and a hare are two different worlds.’ In the first piece ‘Spirit of Nature’ the bear and the hare are lost and they think their world is the only one that exists. 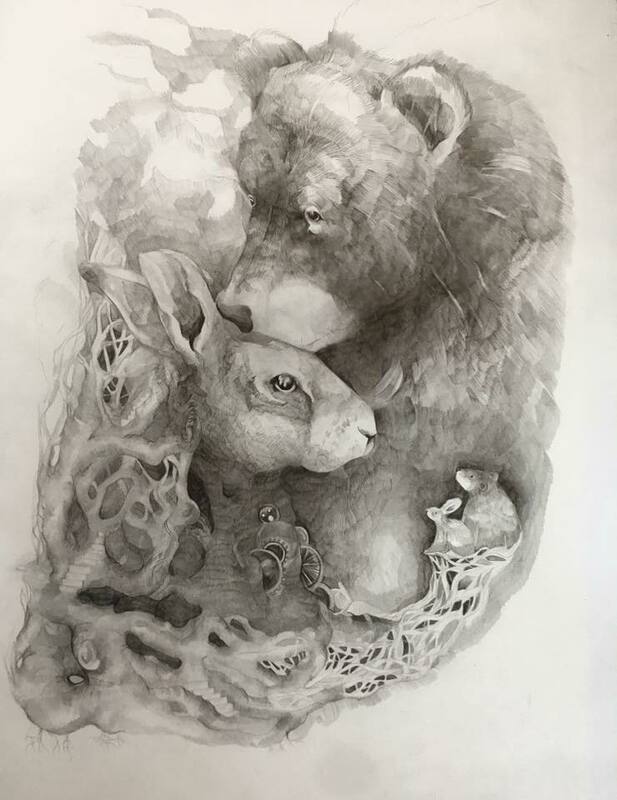 The bear represents the reality, the rational, while the hare stands for the subconscious, the imaginary. In the other piece you can see the moment in which they find each other and realise they are not alone: in the end it doesn’t matter which is real or surreal, everyone has their own reality. I am from Coventry, I’ve lived there most of my life. I started painting from an early age, it runs in the family – my aunt and my cousin are also artists. I’ve graduated from De Montfort University in Leicester and currently have my own art studio in Coventry. ‘Exquisitely Vintage’ where I used to work gave me the opportunity to meet lots of people and to exhibit my works. My first international exhibition was in Belgium, Antwerpen, in 2016. I love nature and wild animals. I recently visited Kruger National Park in South Africa and this place was amazing for inspiration. When a strong experience like that happens to me I do not create straight away, I let it sink in and then later it transfers naturally into my art. Another source of inspiration are various stories such as Grimm’s fairytales where things aren’t what they seem. 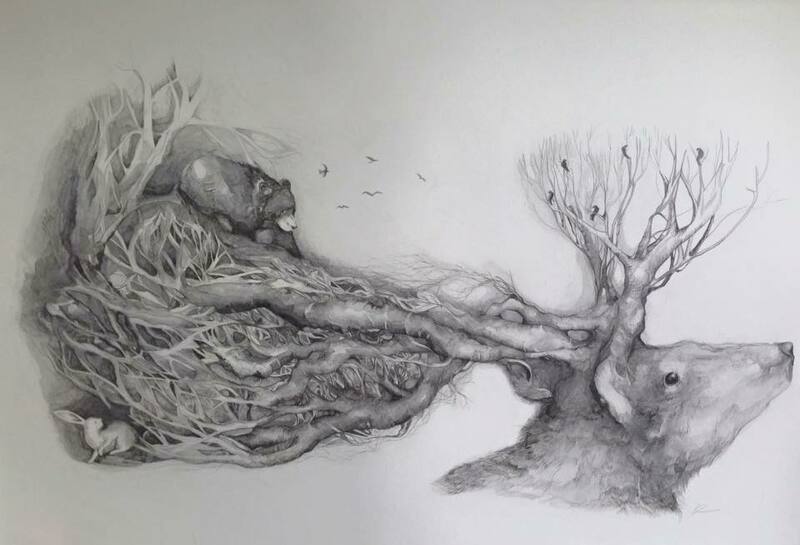 Last but not least, I draw inspiration from the woods – the animals are always coming out from the spirits of nature. Which is your favourite artwork of yours and why? 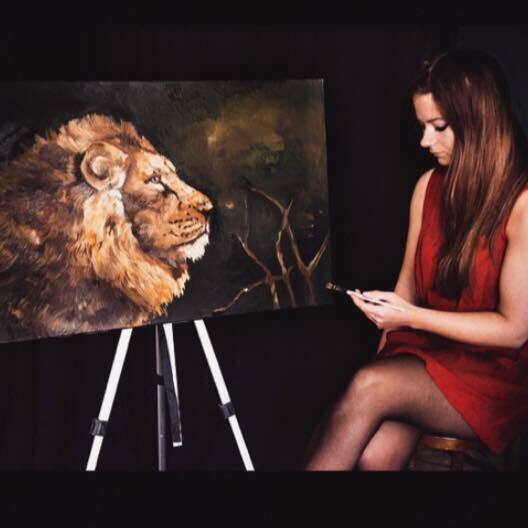 It’s called ‘Fearless’ and it’s an oil painting of a lion. I’ve created it on a day in which I fully felt the passion for doing art again. It just flowed. I chose the title because often you can be hold back by your own fears. 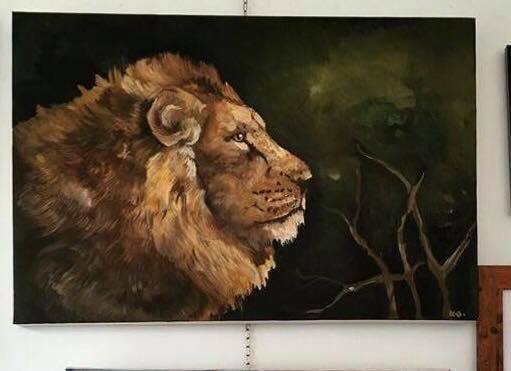 I am not always confident with oils but when creating this particular artwork I let go of this fear and it just happened – a powerful image of a lion: it’s represents what I would like to be spiritually. Green, it’s the colour of nature and to me it’s mysterious. What do people say about your art? People love animals. They say I capture the spirit, the character, of the animals in my paintings. Do you work on commissions? All the time. 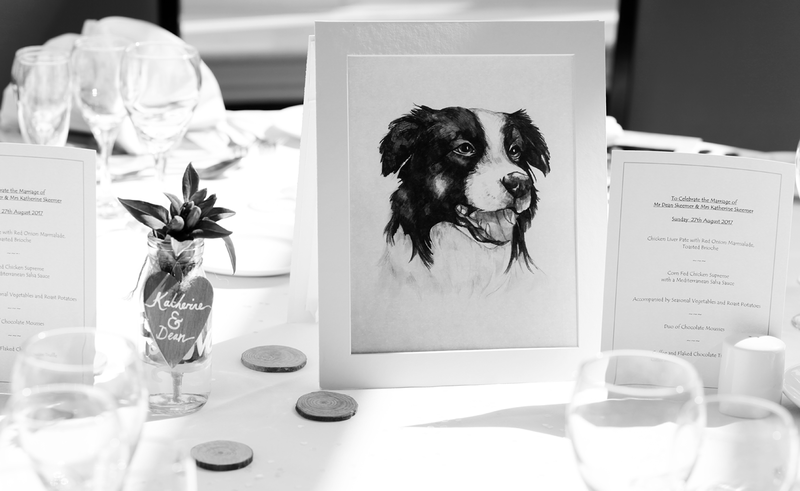 I create pet portraits, I do wedding signage, I paint wall murals (I would have loved to have had one when I was little), and also work on one-off commissions. Do you ever paint people? It’s on my list of things I would like to paint more of. Which is your favourite place and why? It’s where I used to go with my nan when I was little – in Cornwall. I think it’s because I’ve spent so much time there when I was a kid. The sea makes you relax. You take a deep breath, you hear the waves and you let go. Near there is also a place called Tehidy Woods, that’s where you will find The Storybook Tree (it’s actually called that). What would you advise a new starter? Don’t be afraid to completely throw yourself into it and don’t be afraid to try things. Because years go by and if you haven’t tried the things you wanted to you will regret it. It only takes one day, an hour, couple of brush strokes… try not to worry about the commercial side and if you love it, it will be seen and appreciated by people. What is the importance of the materials? It’s essential. Naturally I prefer good quality materials. The materials you choose would depend upon the artwork you are creating. Sometimes a lot more suitable for an instant, quick sketch is a rough piece of paper. It’s often about confidence and high quality materials give you extra reassurance. What’s the best advice you’ve been given about your art? I’ve learned at Uni that often we draw not what we see but what we think we see. That’s why turning the image upside down helps you to free your mind and draw realistically. I usually go straight into it. I always start with the eyes. According to you, what’s the purpose of art? Art provides a viewpoint to the world, whether it’s the past, an artists expression or just simply to stop and feel that moment. It challenges us, makes us feel emotions, to me it’s the most powerful form of communication. Do you own original artworks by other artists? If yes, would you describe some of them? Which is your spiritual animal? I think my animal would be the hare, they’re linked to be sensitive and artistic. They tend to pop up in a lot of my artworks. In a lot of your artworks the animals are looking up. What are they seeking? I tend to draw the animals naturally looking up in my work. I enjoy exploring the idea of the animals link to the spiritual world and their instinct for something more than what we see. By looking up they’re seeking more the world on the ground.